Only four spaces left in the series this year, but so many images are begging me for inclusion! I think I have done pretty well this year in bringing you works by designers with whom you are probably not familiar, and this is yet another example. What we have here is a leaf from a woodblock picture book published in 1817 in Nagoya. Entitled Fugyo Gaso (or alternatively Fukei Gaso), and designed by Cho Gessho, it has been described by expert Jack Hillier as "a ... picture-book which can be recommended to every student of Japanese design." Mr. Hillier was most impressed by Gessho's ability to position his image content within the frame, and in his description of this book, used the word 'balance' over and over again in his praise of the artist. It is also worth emphasizing that images of this type are not 'ukiyo-e'. 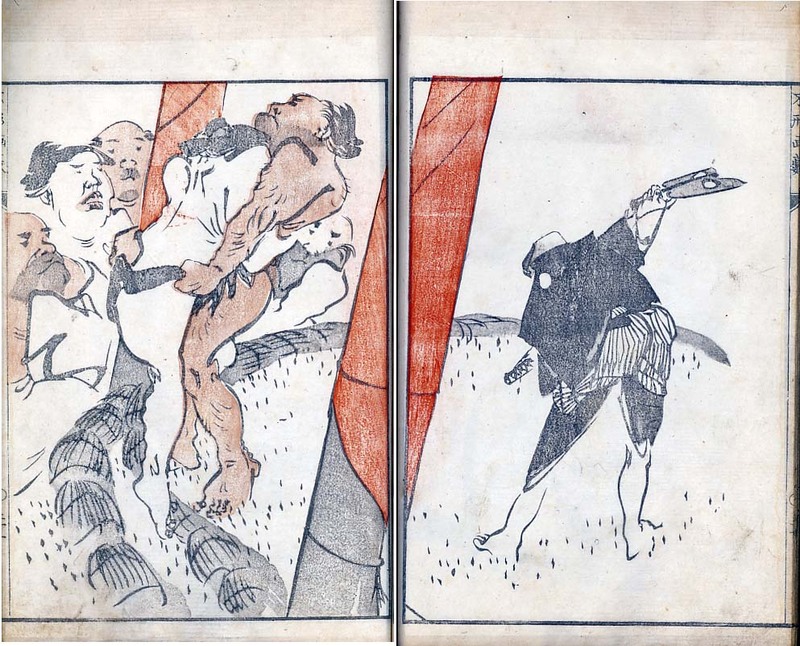 Their disjointed drawing and roughly applied colouring is in strong contrast to the tight control that ukiyo-e of that period was capable of. This is a bit of a problem for me, as my years of ukiyo-e training make me want to 'fix' these 'defects' as I go along, and I had to constantly remind myself "It's OK to leave brush strokes on the bamboo!" So perhaps my print falls short when seen from either side - not neat and clean enough to be attractive, and not rough enough to have the life that was perhaps in the original. I love the e-postcard feature. I love the mixture of your work: high tech web site and beautiful, skillfully executed prints.